Self Directed Programs | Glitter. Run. Repeat. Library Make & Takes: Star Wands! I mustache you a question: Are you ready for No Shave November? I have posted before that I am the Queen of Self Directed Programs at my library. It’s hard to get teens to participate in a library program… but leave out a little craft to do and they are all on it! This past September I decided to bring back the DIY To Go, this time with Paint Sample Notebooks. They were fun and easy to make and all 30 of my kits were made in three weeks. SCORE! Edit 1/12/15: I updated the Dropbox link to all of my Self Directed Programs. You can find the new link here. I recently gave a presentation at the 2013 New Jersey Fall Youth Services Forum entitled “Nothing Passive About It: Portable Programs for Teens on the Go”. I work for a library that has a hard time attracting teens to “typical” library programs (book clubs, crafting events, movie tie in parties), so last year I decided to embrace the Self Directed Program. Almost monthly I set up a “program” that my teens can take part in while stopping by the library. They usually have to fill out a survey, take a quiz, cast a vote. They always get candy for participating, and I like to have a Grand Prize for at least one winner per program. I went through several of my more successful programs during this presentation and now I’m going to share them with all of you. At the end of this post I will share a link to my “Nothing Passive About It” Dropbox folder. Please feel free to borrow or recreate any of these ideas! Remember how I was just saying that I love me some self directed programs? Well, I do! I especially love self directed crafting programs. And how’s this for an easy peasy teen program? I stole borrowed some friendship bracelet instructions from online (I just C&P’d them into a Word document for easy printing), put them in a Ziplock bag with eight pieces of embroidery floss, slapped a branding sticker (DIY To Go…) on the front, and BOOM! Instant self directed program. I had 15 kits go in two days and I just added 20 more. 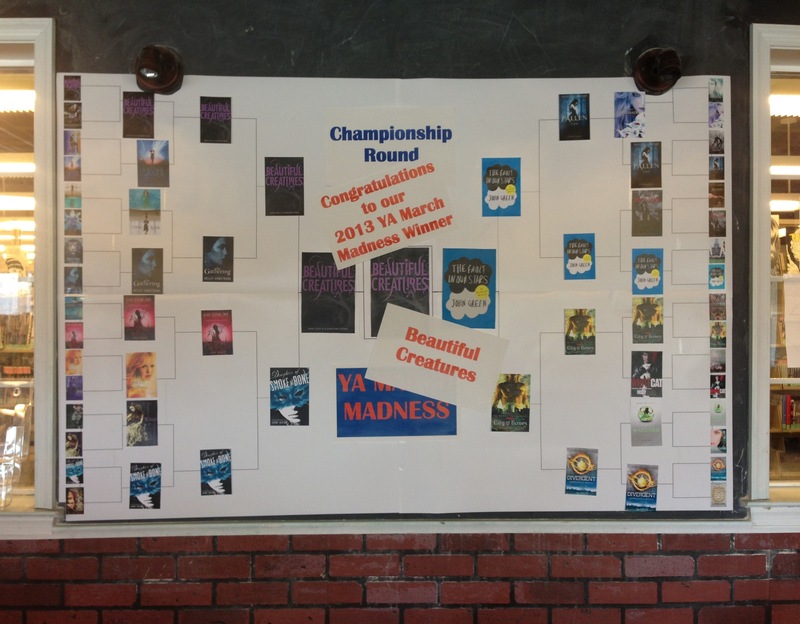 Feel free to steal borrow this idea for your library, teen space, et cetera. In 2009 I helped my library win a grant to build an incredible teen space called The Corner. In the beginning, the space was amazing. We held a few programs and the teens respected their area. However, due to staffing, the popularity of the space, and an overall disinterest in work due to my pregnancy and new baby, The Corner sort of became overrun with a not so great crowd. With the enthusiasm of a new boss and a lot more sleep in my life, I slowly started to take the teen space back. Were our teens really that bad? Welllllllll… it’s not like this library is in a bad area, but the kids were used to being in a walled in, adult free space, and (OMG!) they got a little cra cra. This is when I introduced them to… The Self Directed Program! What is a self directed program, you ask? It’s really just a fancy name for a passive program, where the librarian sets everything up and your audience comes in to do all the work. Over the last year I have held several self directed programs (posts with pics will be coming soon! 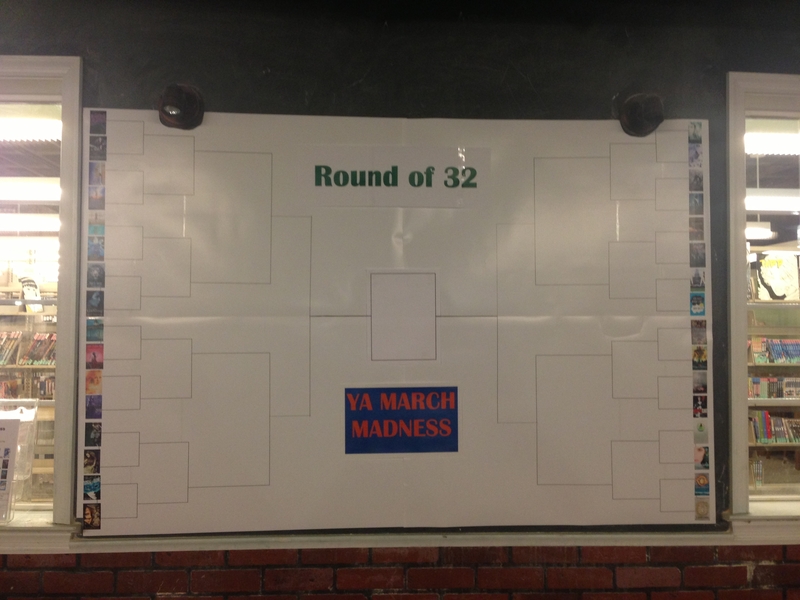 ), but our most recent one, YA March Madness, has been hands down the most popular. 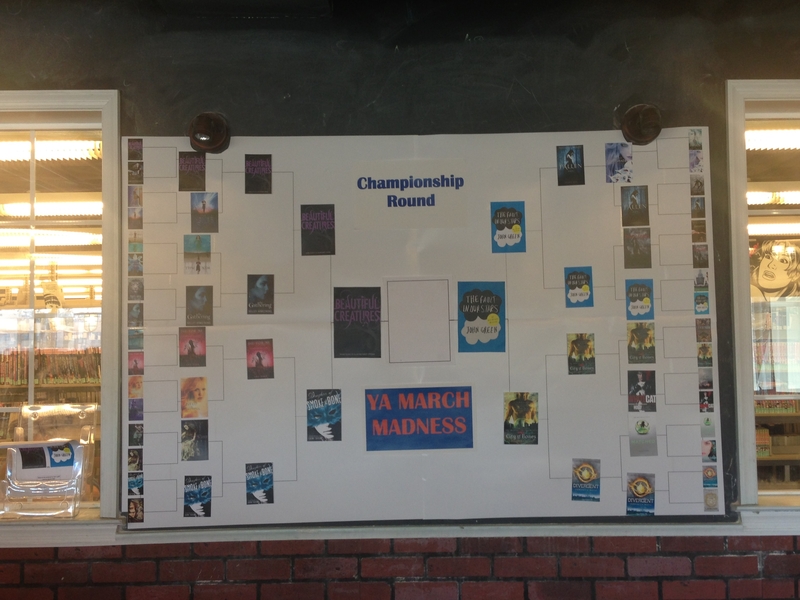 We started out on March 1 with 32 popular Young Adult fiction books. 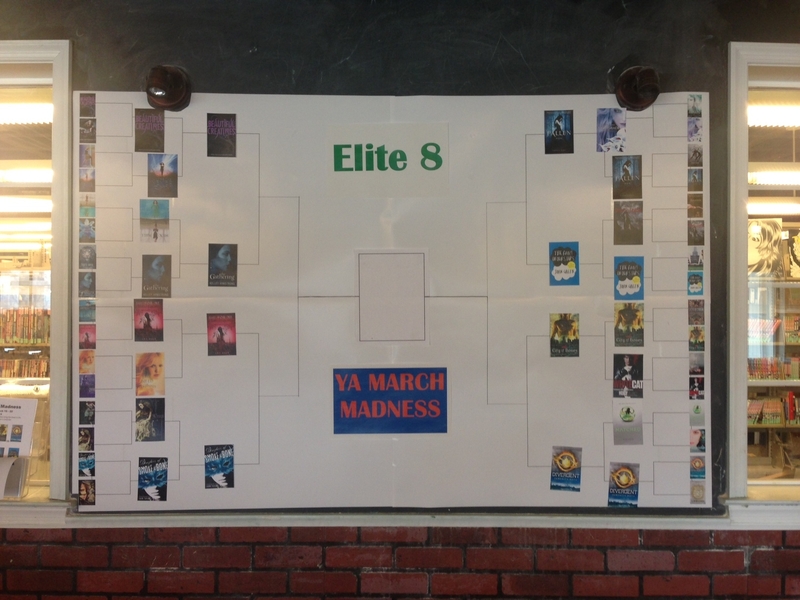 (I’m super lucky that my PR lady is awesome and she made me these incredible posters for my bracket.) Next to the bracket, I put out my first ballot. Over the next five weeks, I had 107 ballots given to me. The teens were allowed to vote once a week and I gave them a piece of candy in exchange for the ballot. I also gave them the opportunity to win a gift card to Spoon Me (our local FroYo place). 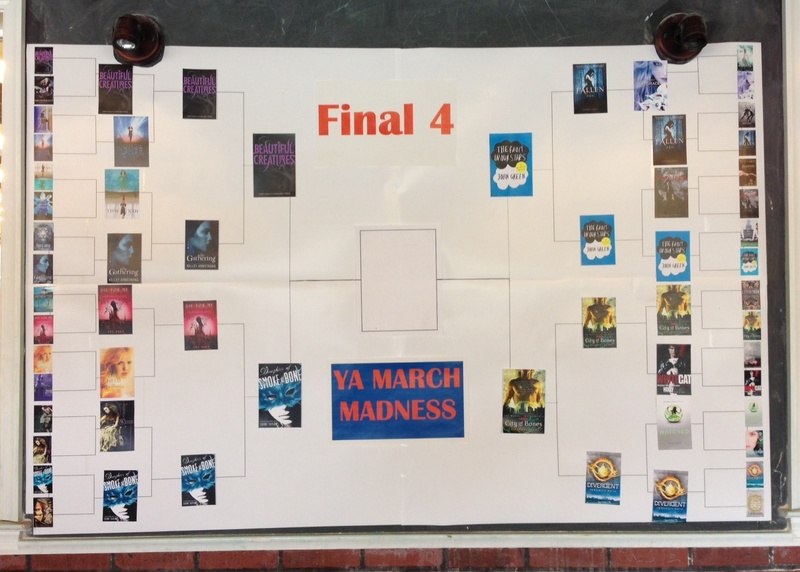 Each week I tallied up the winners, made a bigger book cover for the new bracket, and created a revised ballot. …and finally we had a winner! So, why do I love me some self directed programs? 1) It is a physical reminder that you are in a library, complete with books and teen programs. 2) It gives me an excuse to talk to teens about our programs. 3) It opens up dialogue (such as, “What do you mean you haven’t read The Fault in Our Stars, Miss Christen?!?? ?”) with my teenagers. 4) Teens who can’t make it out for specific programs still get to participate in library programming. 5) I love to give out candy and gift cards!